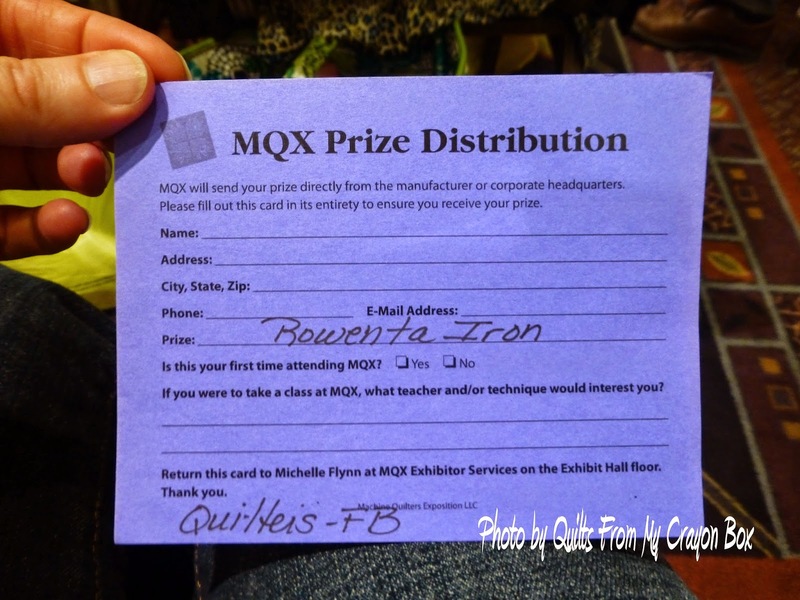 My 2nd day at MQX East started just as early as the 1st day with an 8am class. 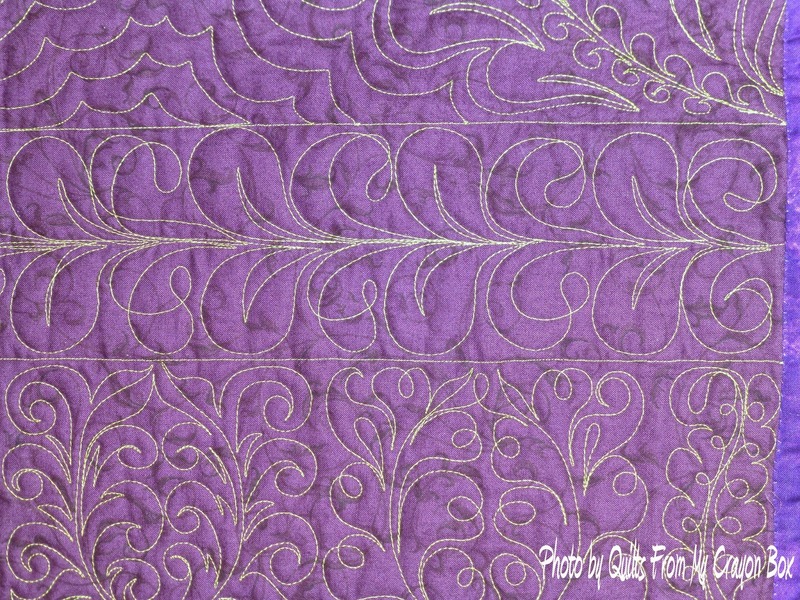 This one was another 4 hour hands on class called "Add, Alter, Delete and Change" and the instructor was Sue Patten. First let me tell you that if you have never taken a class with Sue, you should. She is hilarious and her off beat and relaxed style really made the class so much fun. I will most definitely take another class again with her in the future. 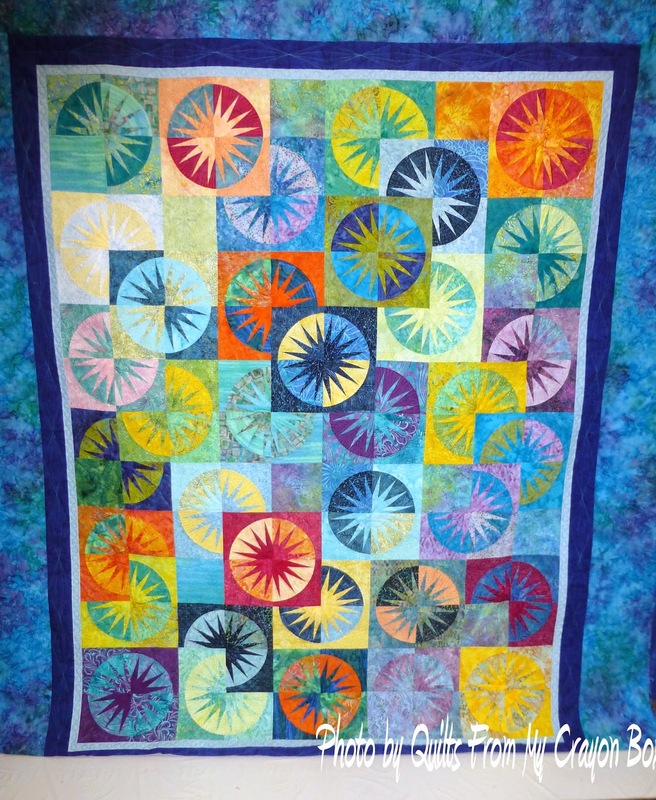 This class focused on quilting a design and then adding something or altering it etc to make it just a little bit different from the 1st design. We went over each page of the handout and she showed us how to create each design and then headed to the machines to try them for ourselves. 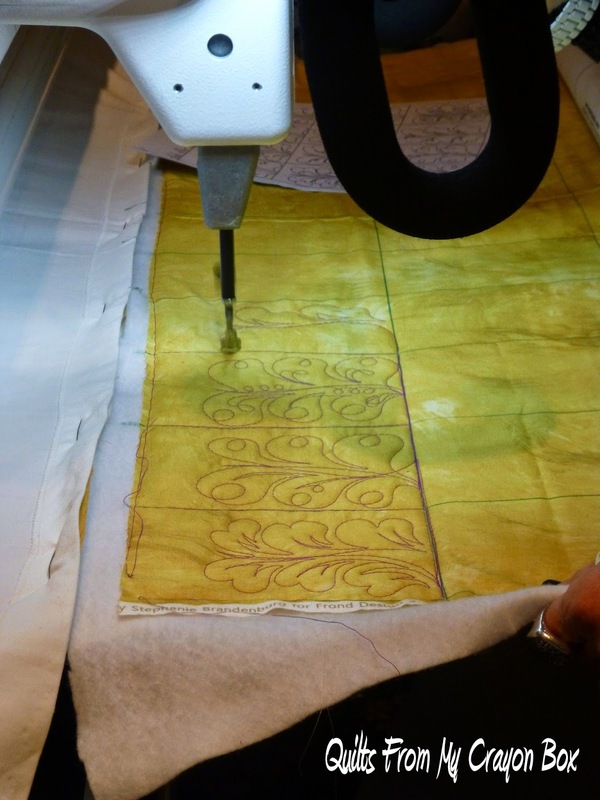 Here is Sue demonstrating the 1st couple of designs one the machine. Here is it up closer. 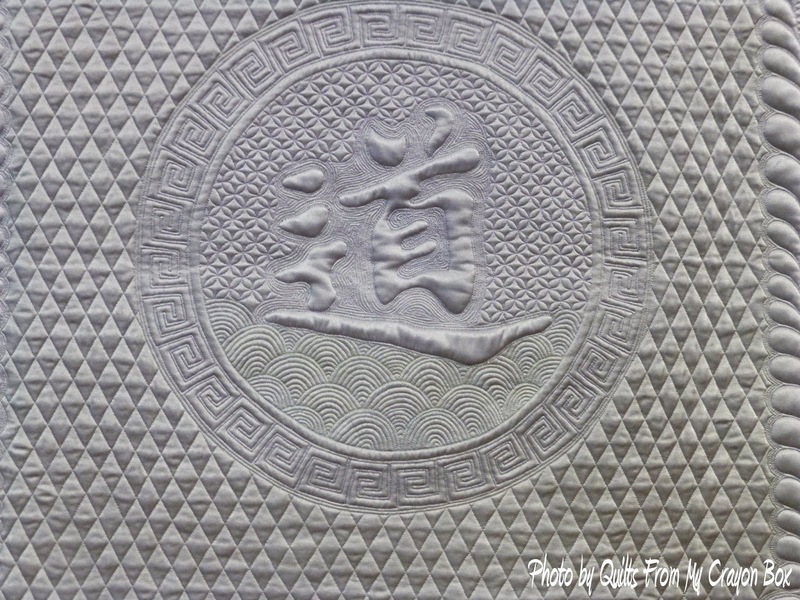 ﻿You might be able to see how each design is similar but also just a tad bit different. It was interesting that Sue and a few others in the class found the room chilly but I didn't, which isn't the norm. Usually I'm the cold one in the room. ﻿It must have been my nervousness again. 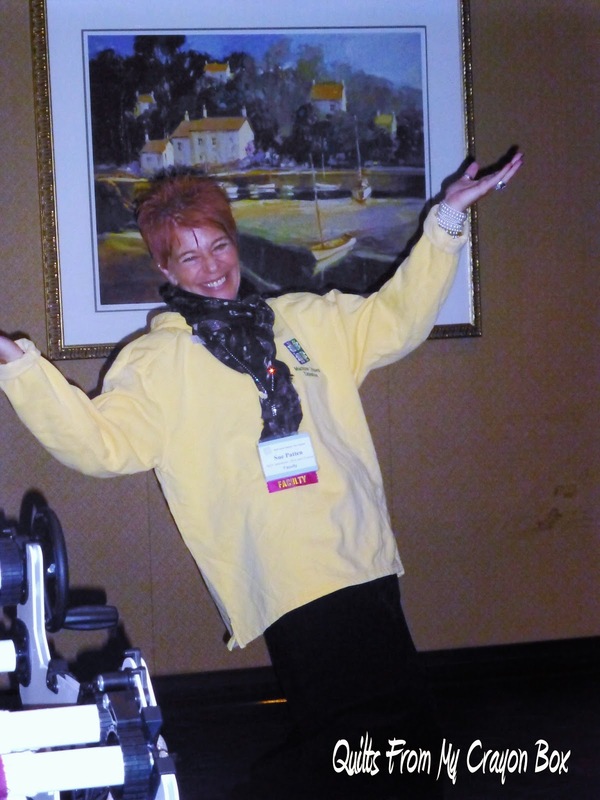 Anyway Sue donned a sweatshirt and struck a great pose. 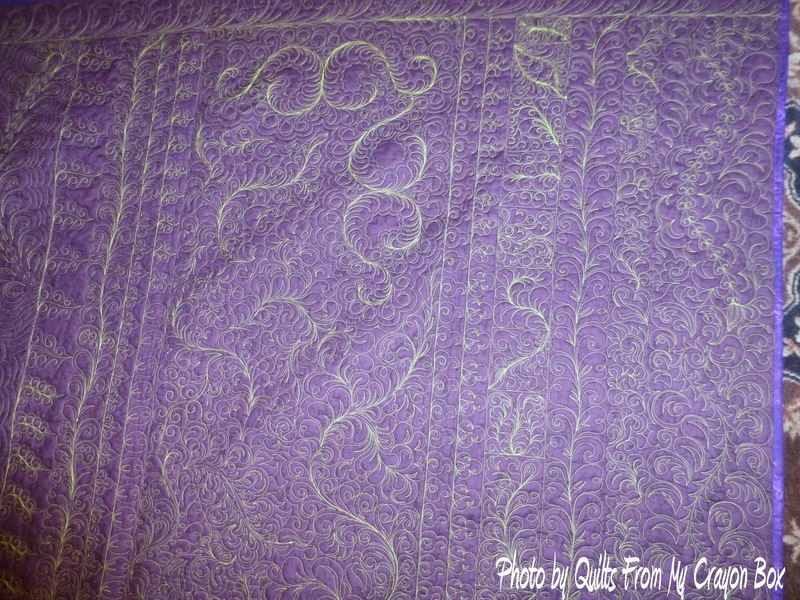 This is what some of my 1st attempts look like. Not great but not totally horrible either. 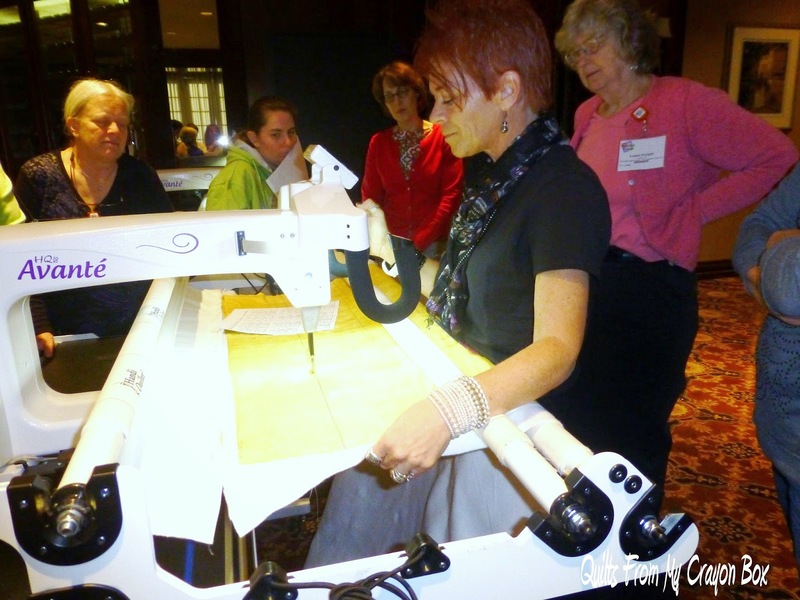 ﻿I really had a hard time controlling my machine and the handles seemed to me to vibrate a lot. 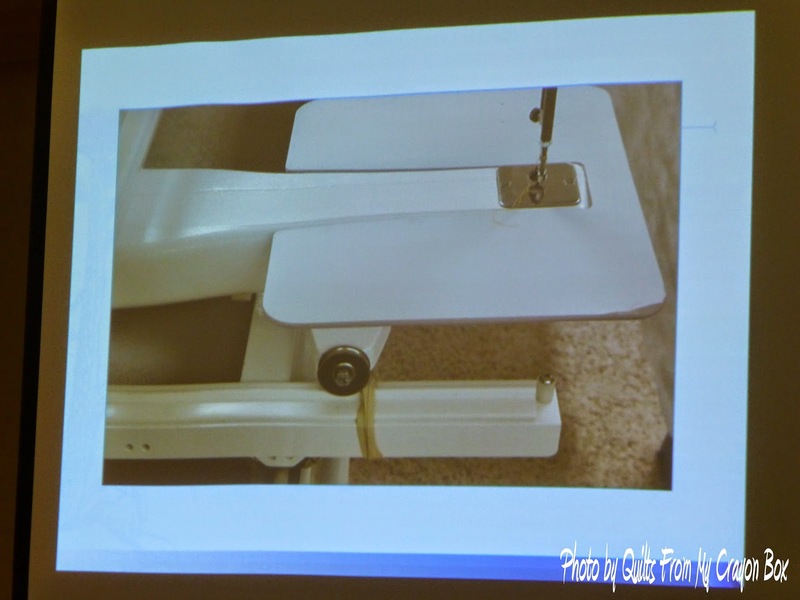 I'm not sharing more photos of my sample piece but I'll just say that my frustration with the machine grew as the class went on even though I had the dealer rep check it out and she deemed it working properly. 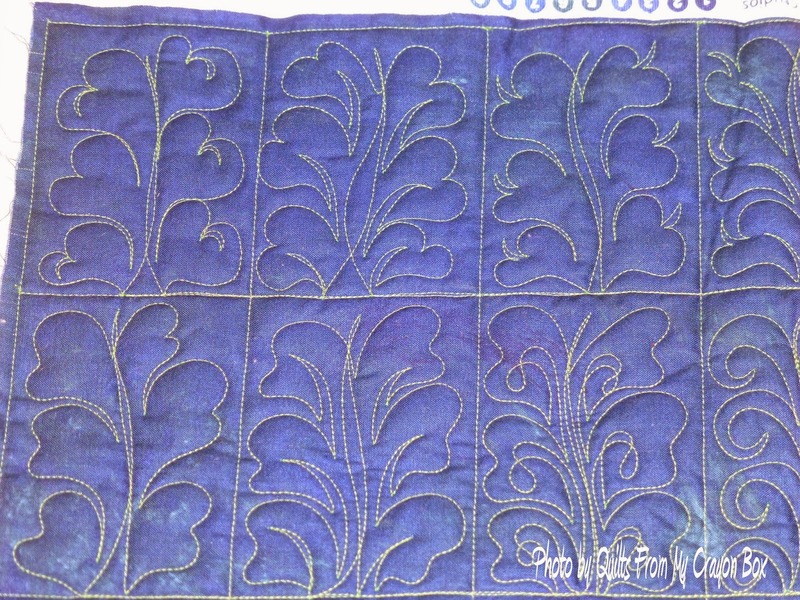 Although my quilting in this class left a lot to be desired, it gives me a goal to work towards, after I get in a lot more practice at home on my own machine. 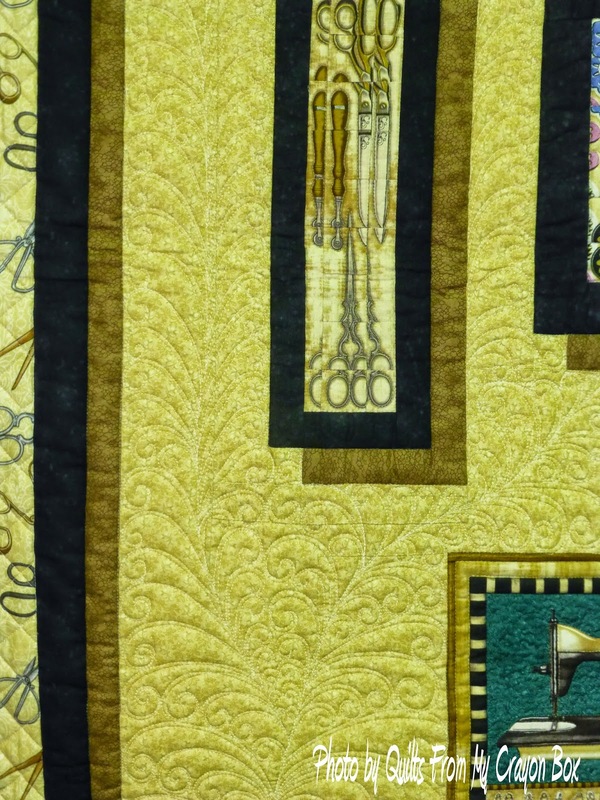 This is one of Sue's quilt where she used a lot of the designs that she taught us in the class. 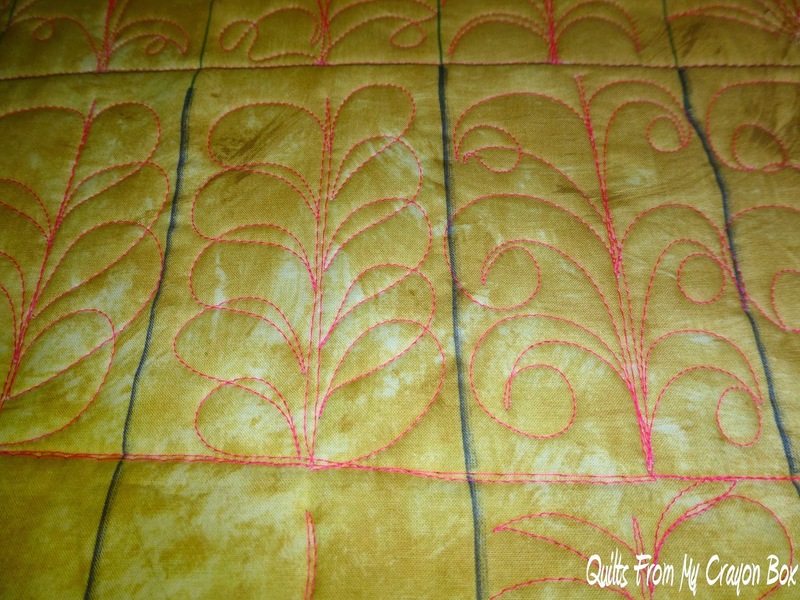 I took pictures of the back because the quilting showed up so much better. After that class I took a much needed break and grabbed a bite to eat and then headed off to see some more of the show and check out what the vendors had to offer and to test out some of the other brands of machines on display. 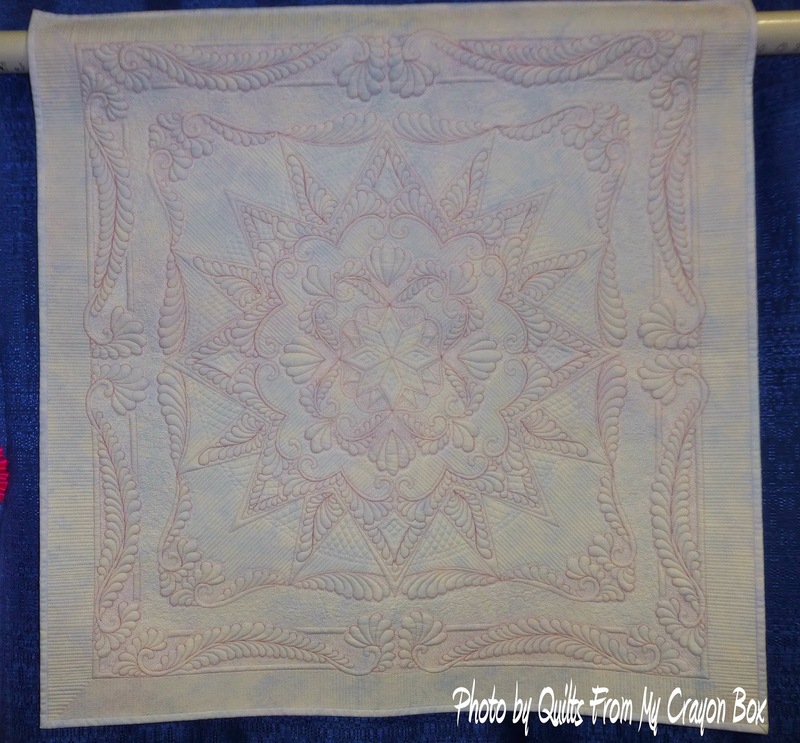 My afternoon class was "It's More Than Just Edge to Edge" with the fabulous Kimmy Brunner. Again I found her to be a great instructor and I loved her style of teaching. She is another instructor who I will put on my favorite teacher list. 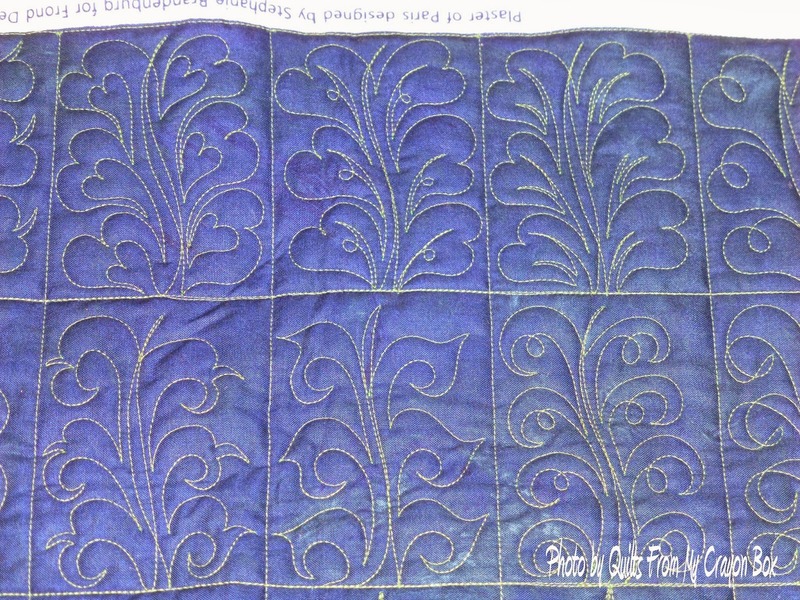 This class focused on edge to edge quilting, whether it be using a panto or free motion. She also gave us a ton of her Cheap Tricks tips. This little tip showed us how to create channel locks for our machines if it doesn't already have them using big rubber bands. 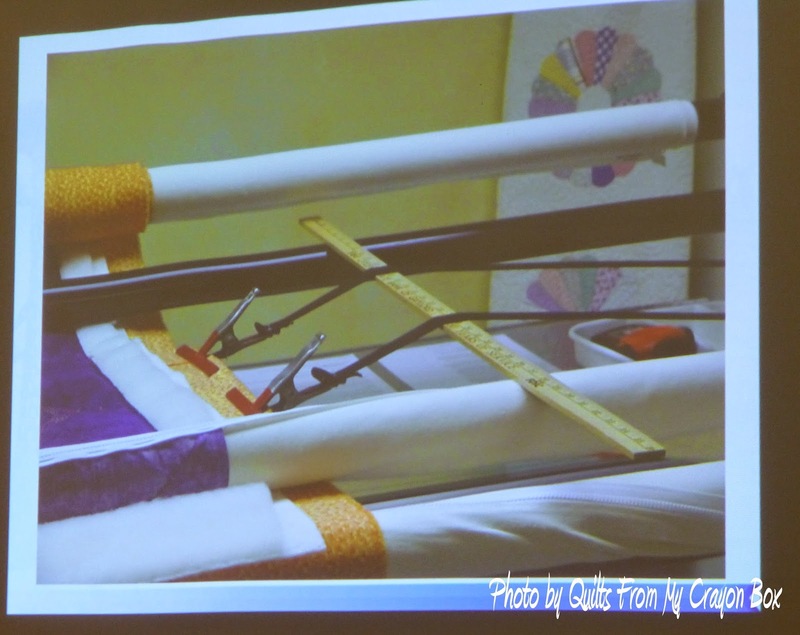 I had also read about this idea before somewhere, using yardsticks to raise up your side tension straps to keep your carriage from knocking into the side clamps, but seeing this visually helped explain how it works. Of course I took copious notes ﻿on all the other tips she offered and if you aren't already aware, she offers up tons of other free learning tools on her website. Check it out. 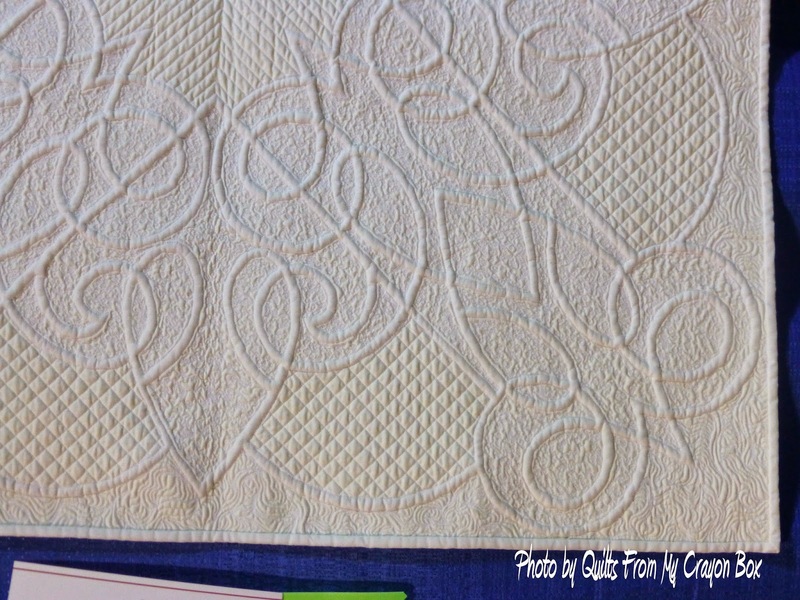 Along with all the goodies we received from her...a piece of batik fabric, a sample of Magna-Glide bobbins from Fil-Tec, a 50% off coupon for her Craftsy class and a free pantograph provided by Willow Leaf Studio, it was my lucky day as I won her class door prize, her DVD "Machine Quilting for Beginners". Whoo hoo! This totally made my day. But the fun wasn't over yet. 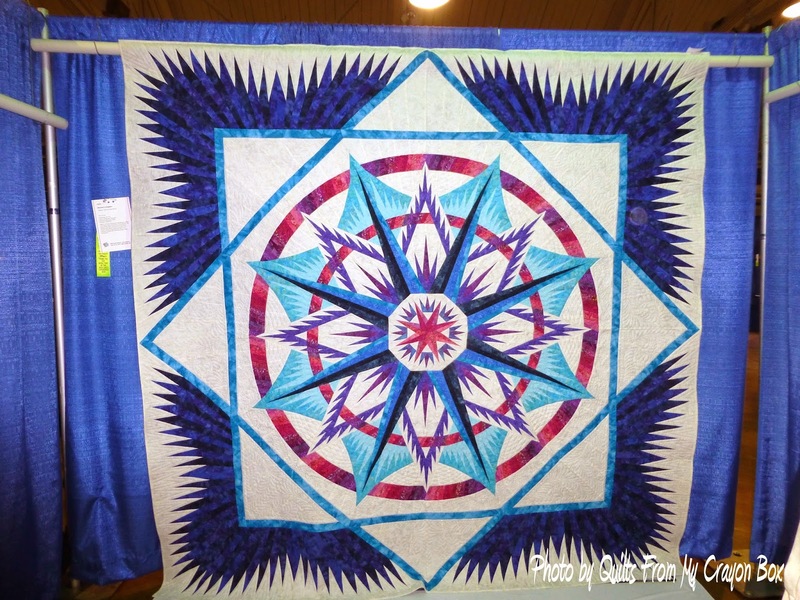 After a great dinner with Mandy and Sue we headed to the Quilter's Forum and Facebook Friends meet up. It was a great session and I learned a ton from the panel which included Judy Woodworth, Gina Perkes, Lisa Calle, ﻿Laurie Tigner and Andrea Bodenshire. Plus I was lucky again and won one of the door prizes, a Rowenta Iron. 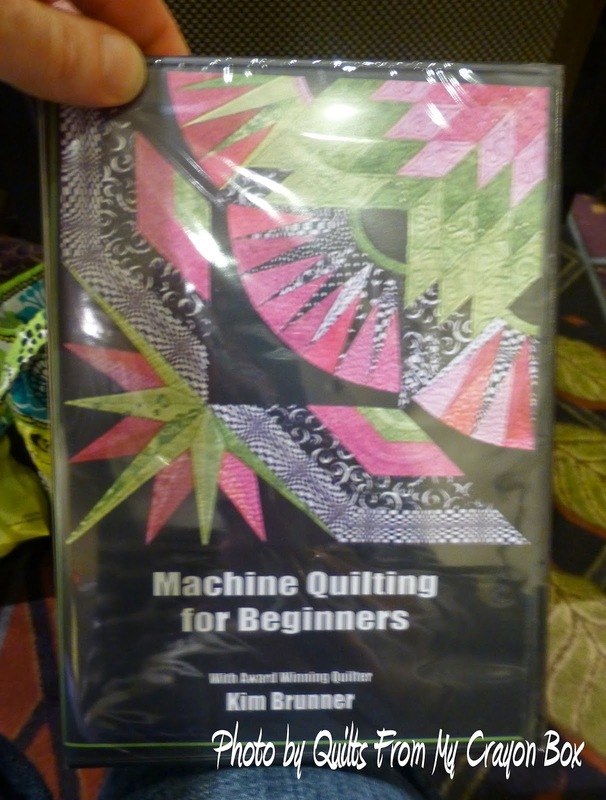 I don't know what magical quilting fairy I was being watched over by that day but it was nothing less than fantastic. 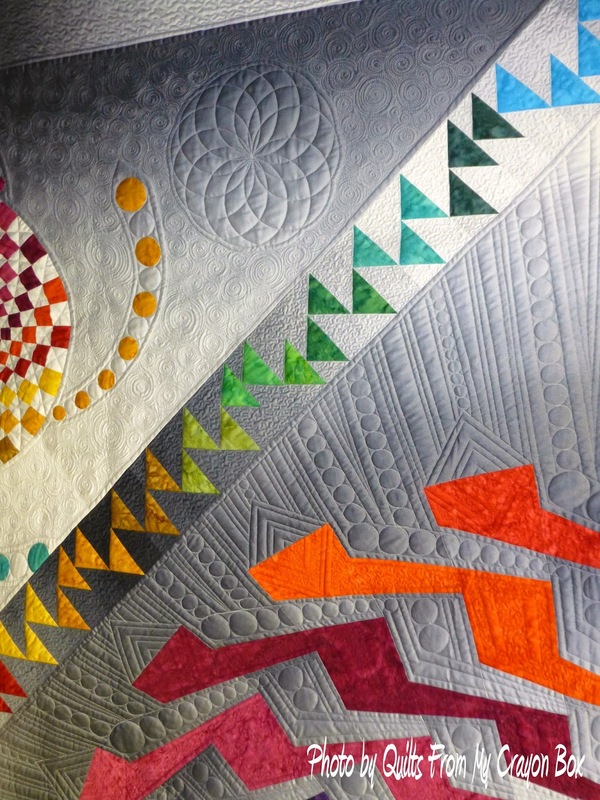 Speaking of fantastic, here are some more photos of the wonderful quilts at the show. 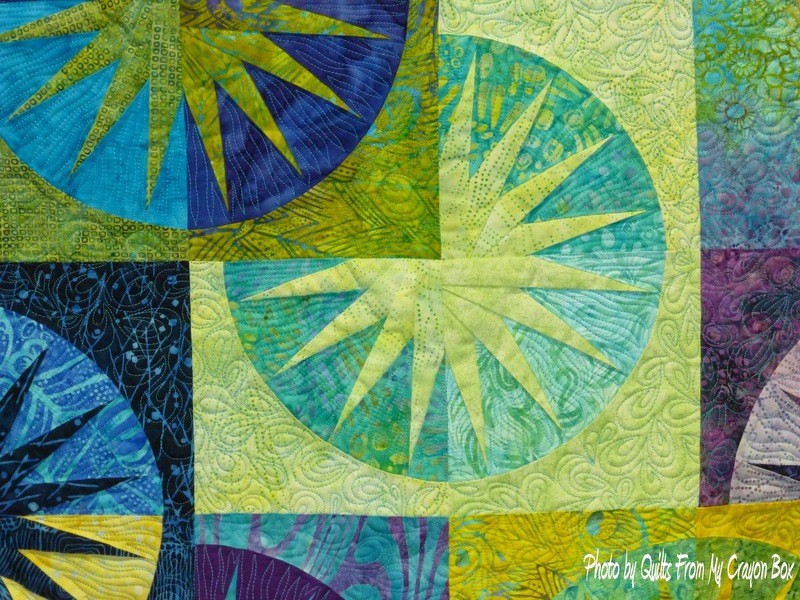 Mariner's Compass, pieced and quilted by Diane Durr. 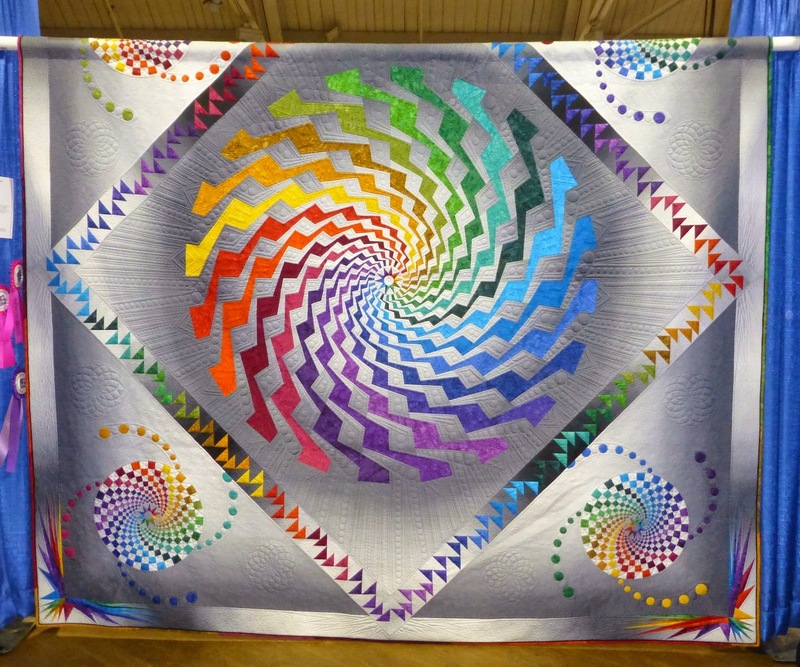 Byrne's Spiral, Winner of the Photographer's Choice Award and 2nd Place Winner in the Custom Our Daily Bed category. 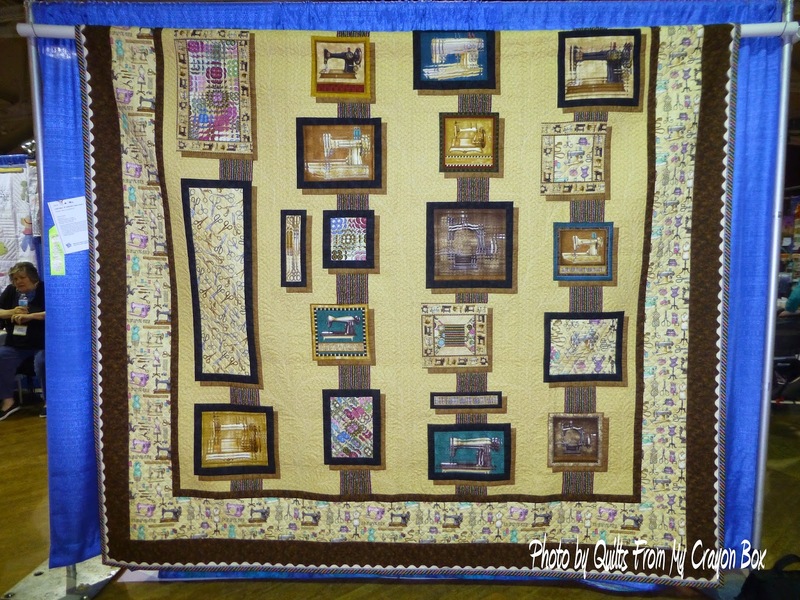 Pieced by Beth Nufer and quilted by Clem Buzick. 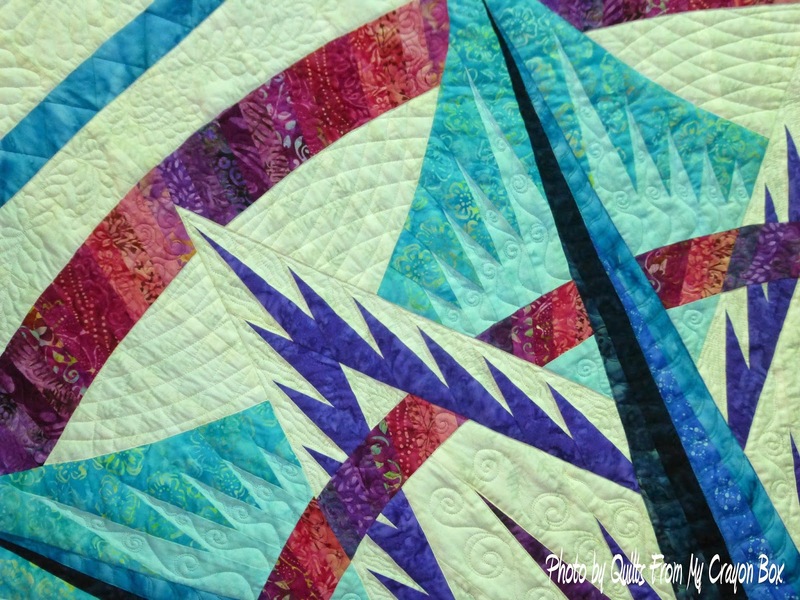 Lulu's Sky, pieced by Kristy and Lulu Boule and quilted by Donna Dahl. 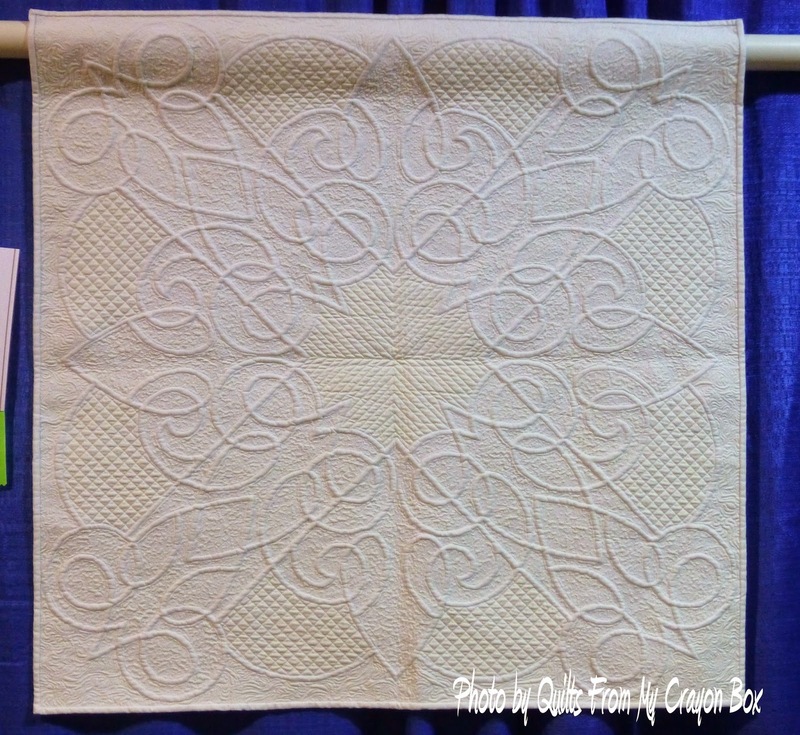 Knotted Jubilee, quilted by my friend Liz Haskell. 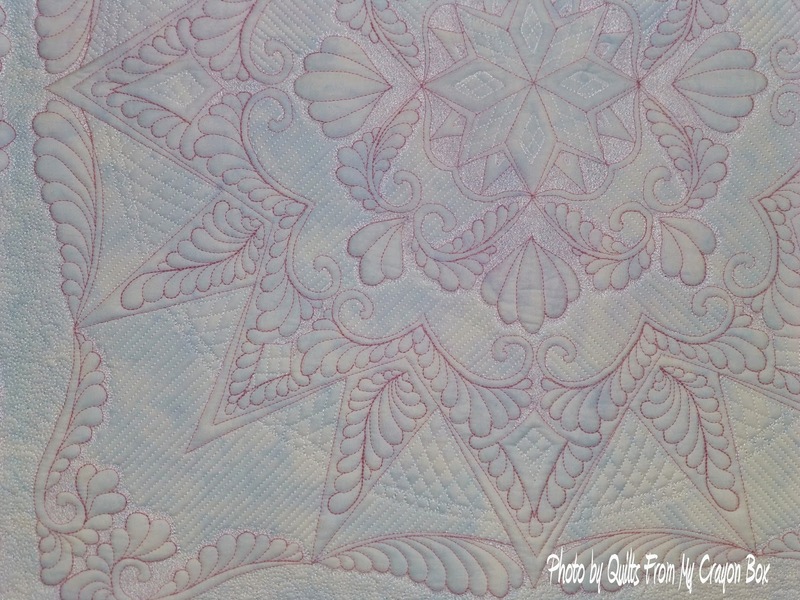 Pink Parfait, 2nd Place Winner of the Wholecloth Small category, quilted by Donna James. 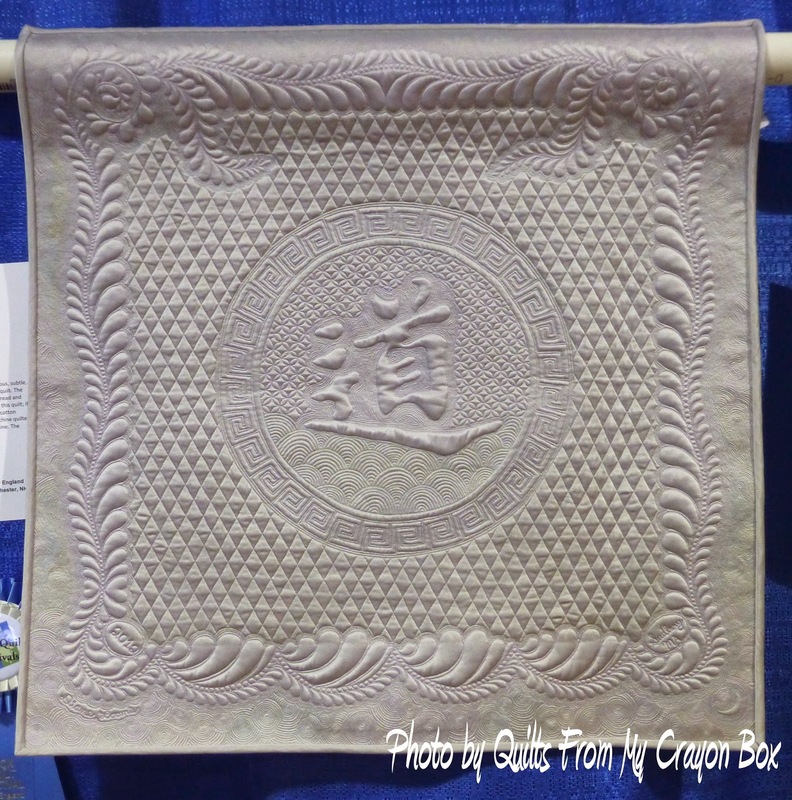 Reflections of Tao, 1st Place Winner of Wholecloth Small and Best Machine Quilting-Sit Down﻿, quilted by Diane Loomis. This is just part 1 of all of the pictures I took that day. The Part 2 post is up next. I told you you'd love Kimmy! Isn't she awesome? And I love that tip about the rubber bands - I hadn't seen that before but I've GOT to give it a try. 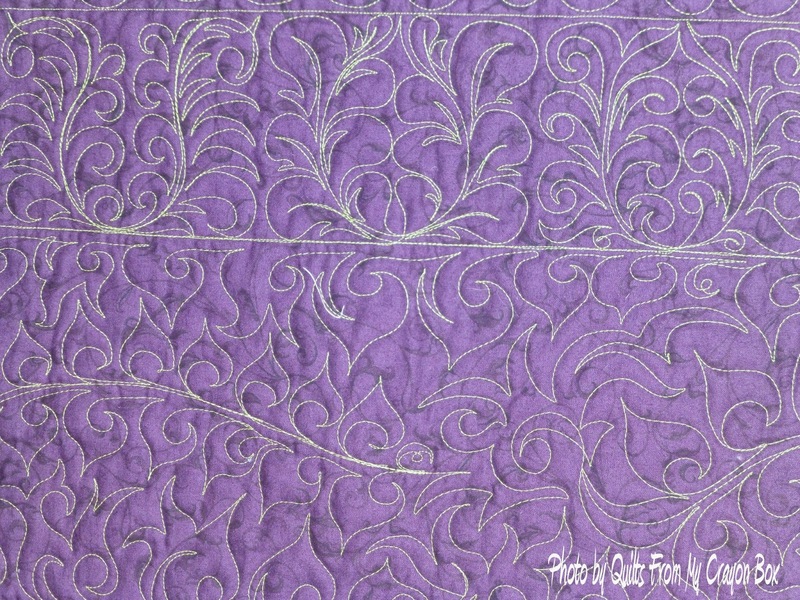 It would be so nice to be able to do straight line quilting on the frame! 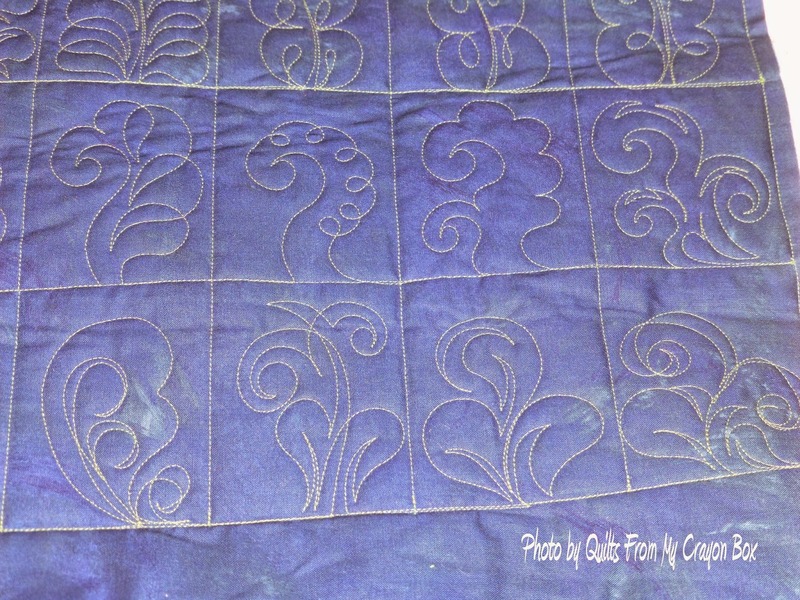 And just out of curiosity, what brand of quilter were you having such a time with? I may have hd a similar experience and I'm curious if it's the same kind I was using. I'm sooo jealous! What a great class. LOVE the rubberband and yard stick ideas. I was fighting with my clamps last night and finally tossed them off. Thanks for sharing all this great info. again just speechless, don't know if the clamp thing will work with our machines, on the v17 we have the quilt very close to the bed of the machine, I'd remove them when getting close.